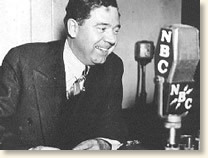 Huey Long speaks on his "Share The Wealth" Program, May 2, 1935. Admirers of Louisiana's Senator Huey Long called him the "Kingfish." He ruled his home state like a Czar and built a political dynasty whose remnants survive today. He became governor in 1928 and was elected to the U.S. Senate in 1930. His ambition was boundless and he next set his sights on the White House. He had no love for Franklin Roosevelt or the New Deal, saying that the N.R.A. (National Recovery Program) stood for "Nuts Running America." In order to confront the crisis of the Depression he proposed a "Share The Wealth Program" that would guarantee an annual income for every American. His flamboyance and populist stand against big business attracted many followers. His demagoguery also attracted many enemies, requiring that he surround himself with a personal army of bodyguards. On the evening of September 8, 1935, Long and his heavily armed guards walked a corridor beneath the Louisiana State Capitol in Baton Rouge. Waiting in the corridor was Dr. Carl Weiss who bore a personal grudge against the Kingfish. As Long's entourage rounded a corner, Weiss confronted them igniting a fusillade of gunfire. Between 24 and 61 bullets ripped through Weiss's body killing him instantly. One bullet slammed into Huey Long who fell wounded to the floor. Long's bodyguards later claimed that Weiss shot the Senator and they returned fire. Modern analysis raises the possibility that the bodyguards overreacted to Weiss's approach and Long got caught in the hail of ricocheting bullets they let lose. Whatever the truth, thirty hours after the event the Kingfish was dead. References: Martin, Thomas, Dynasty: The Longs of Louisiana (1960); William, T. Harry , Huey Long (1969).